With the addition of The Arroyo Room at Dos Lagos Golf Course we are here to help you with your next event. Nestled next to the Cleveland National Forest and Temescal Wash, The Arroyo Room offers dramatic and sweeping views providing the perfect backdrop for your special day. Dos Lagos Golf Course provides several packages to create an unforgettable experience. 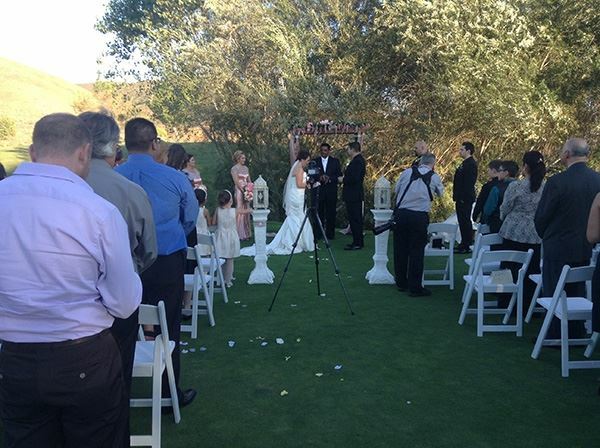 Wedding Ceremonies at the Dos Lagos Golf Course Include: Sunday-Thursday starting at $450 Friday-Saturday starting at $500 Our wedding ceremonies include the following: The Green • The Green ceremony site is located on the putting green between the 1st and 10th tees providing sweeping views of the valley with a tranquil setting. . • 100 white padded resin chairs. .• Rehearsal by appointment prior to your event. • Access to several scenic on property photo locations. Per person pricing is subject to applicable taxes and 20% service charge. Please contact us for our complete terms & conditions. Per person pricing is subject to applicable taxes and 20% service charge.Please contact us for our complete terms & conditions.